Born: 1 June 1880, Hankey, Eastern Cape, South Africa. Died: 15 September 1962, Pietermaritzburg, South Africa. Alwin Karl Haagner had no formal schooling but was educated by his father, Sigmund Haagner, who was chief accountant at the explosives factory at Modderfontein, near Johannesburg. Alwin started his career in the accounts department at Modderfontein, but was more interested in natural history, particularly in birds. His first scientific paper, "Notes on the Cape monitor" (The Zoologist, 1899), was published when he was only 19 years old. It was followed by three papers on the birds of Modderfontein in The Ibis during 1901-1902. This work led to his election as a colonial member of the British Ornithologists' Union, and as a Fellow of the Zoological Society of London. Early in 1904 he took the lead in the formation of the South African Ornithologists' Union, which was formally launched at a meeting in Johannesburg on 8 April that year. 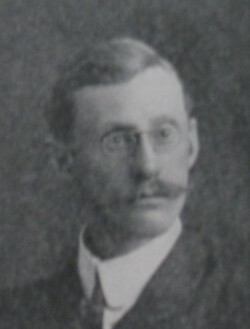 Haagner was a member of the committee that framed its rules and served as honorary secretary of the union from the beginning until it amalgamated with the Transvaal Biological Society in 1916 to form the South African Biological Society. During most of this time he was also the union's honorary treasurer and one of the editors of its Journal. From 1905 to 1914 he made regular contributions to the Journal, dealing with topics such as the birds of Modderfontein (1905); the Honey Guides (1907); the birds of the Albany district (with R.H. Ivy*, 1907); the protective resemblance of South African birds (1908); a new species of Flycatcher from Zimbabwe (1910); the wild birds of the Zoological Gardens in Pretoria (1912); and the game- and waterbirds of the Pretoria bushveld (1914). In 1907/8 Haagner presented 16 species of grasses from Modderfontein to the Transvaal Museum (now the Ditsong National Museum of Natural History). Late in 1908 he was appointed as assistant for ornithology at the museum, thus becoming the first South African to hold a full-time appointment as a professional ornithologist. Under the guidance of the museum's director, Dr J.W.B. Gunning*, he built up the bird collection and published descriptions of several new species of birds in the first volume of the Annals of the Transvaal Museum (1909). In "A revision of the South African species of Cisticola (grass warblers)" (Ibid, 1909, Vol. 1(4), pp. 227-232) he brought much needed clarity in the taxonomy of this genus. Gunning and he compiled "A check-list of the birds of South Africa; being a record of all the species known to occur south of the Zambezi-Cunene line" (Ibid, 1910, Supplement to Vol. 2, pp. 71-156). With R.H. Ivy* he published Sketches of South African bird life (Cape Town, 1908, 181p), of which the third revised and expanded edition appeared in 1923. Also in 1908 a lengthy paper by him, "South African birds of prey: Their economic relation to man", was published as Pamphlet No. 1 (23p) by the South African Ornithologists' Union. Later he compiled "A descriptive list of South African birds; Part 1, Families Struthionidae to Scolopacidae", which was published as Bulletin No. 3 (1914, 34p) of the South African Ornithologists' Union. Towards the end of 1909 Haagner was appointed superintendent of the Transvaal Zoological Gardens (from 1916 the National Zoological Gardens) in Pretoria, then still an integral part of the Transvaal Museum. His ornithological work at the museum was taken over by Austin Roberts*. When the zoo became an independent institution in 1913 he was appointed its director, a post he held until 1926. During this period he campaigned actively for the establishment of national parks to preserve southern Africa's wildlife. In 1915 he spoke on "Game and bird protection in South Africa" before both the Transvaal Biological Society and the South African Association for the Advancement of Science. He was co-author, with W.T. Hornaday, of The vanishing game of South Africa: A warning and an appeal, published by the Permanent Wild Life Protection Fund (Pretoria, 1922, 55p). With J. Stevenson-Hamilton* he played a significant role in the creation of the Kruger National Park and the National Parks Act (No. 56 of 1926), and was a member of the first National Parks Board of Trustees. During World War I (1914-1918) he served in the South African Constabulary and was awarded the South African Medal with three clasps. After the war he published South African mammals: A short manual for the use of field naturalists, sportsmen and travellers... (Cape Town, 1920, 248p). In an effort to obtain funds for the zoological gardens Haagner applied for the zoo to act as a clearing station for animals destined for Europe and the United States. This allowed him to display these animals, and brought him into contact with dealers in wild animals. The scheme proved a financial success, but rumours that he traded in animals for his own account led to the appointment of a commission of inquiry in 1926. The commission concluded that he had used his official position to further his own interests, with the result that his employment was terminated. He then settled on a small farm near Beira, Mozambique, where he continued his ornithological work, publishing his observations on the birds of the Beira district in the journal Ostrich until the nineteen-forties. At that time he returned to South Africa and worked as an accountant in Pietermaritzburg, where he remained for the rest of his life. Following a successful lecture tour to the United States in 1920 the University of Pittsburgh awarded him an honorary Doctor of Science (Sc D) degree in 1922, in recognition of his contributions to wildlife conservation and ornithology in South Africa. He was elected an honorary member of the British Ornithologists' Union and the Royal Hungarian Bureau of Ornithology, and an honorary Fellow of the American Ornithologists' Union. He joined the South African Association for the Advancement of Science in 1904; was a member of the Transvaal Biological Society, serving as secretary during 1913-1914, and became a foundation member and joint vice-president of its successor, the South African Biological Society, in 1916. The South African Ornithological Society later elected him an honorary life member. On 25 May 1910 he married Johanna A. Moll, with whom he had a daughter. After her death in 1922 he married Gwendoline E. Allen, with whom he had a son. Annals of the Transvaal Museum, 1908-1910, Vol. 1-2. Fitzsimons, V. & Brain, L. A history of the Transvaal Museum. Transvaal Museum Bulletin, 1972, No. 13, pp. 5-11. Journal of the South African Ornithologists' Union, 1905-1914, Vol. 1-10. Obituary: Alwin Karl Haagner, Sc D, 1880-1962. The Ostrich, December 1962, Vol. 33(4), p. 56. South African Association for the Advancement of Science. Report, 1905/6, 1910, 1915, 1918. South African Journal of Natural History, 1920, Vol. 2(2), Roll of members [of the SA Biological Society]. South African Ornithologists' Union. South African Journal of Natural History, 1918, Vol. 1, pp. 22-23. The Transvaal Biological Society. South African Journal of Natural History, 1918, Vol. 1, pp. 24-32. Transvaal Museum. Annual Report, 1907/8. Van den Berg, P., Van den Berg, I. & Hopkins, P. The first hundred years, National Zoological Gardens of South Africa. Centurion: Zoroaster, 2000.